I'm so pleased to share with you the first video of my new web series Happier Place. Actually, the videos are just one element of a the outdoor leisure brand Happier Place that Scott and I launched this week. Happier Place wants to help you get happier by having more outdoor fun! Happier Place offers articles, photos and videos featuring outdoor and get-happier tips, inspiring people interviews, destination profiles, picnic and drink recipes, in addition to a few products - all to encourage people to go exploring more often, enjoy nature responsibly, have fun, feel connected and create lasting memories. I plan on writing a longer post about the whole endeavor and the ideas behind it in the future. For right now, let's just focus on the video aspect. Basically, my Moving Postcard web series has evolved into the Happier Place web series. Instead of just the 1-minute videos, the new series features longer videos showing locations that might make you happier just by watching them... or inspire you to take a break, go outside and have some fun. 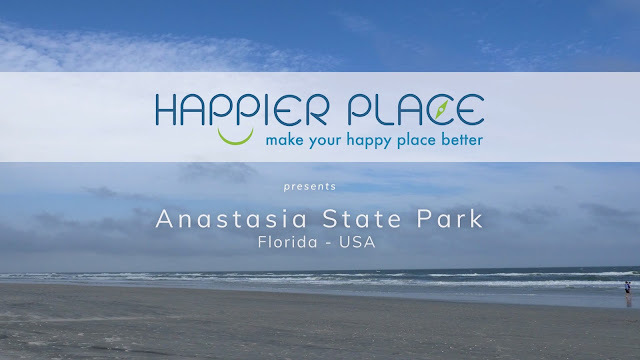 The first video features Anastasia State Park near St. Augustine, Florida. With a vast beach, intriguing wetlands, abundant wildlife and plants, it’s an ideal #HappierPlace… just waiting for you.